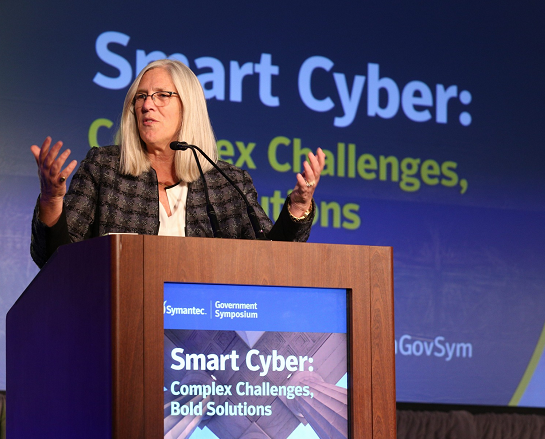 Gordon addressed the audience gathered at Tuesday’s Symantec Government Symposium in Washington, D.C. on the critical need for public-private collaboration in addressing today’s complex cybersecurity challenges. “National security is our collective responsibility,” said Gordon, noting that often the burden of national security, especially with respect to cybersecurity, falls on the Federal government. The Federal government does have certain advantages when it comes to understanding the complexities of cybersecurity, Gordon noted. Its broad reach and insights into what’s happening on a global scale is unparalleled, along with a rich tradition of analytical trade crafts that can be applied to the digital space. But, while the Federal government may have the tools and infrastructure in place, the private sector has higher volume and specificity in its data. “Success in not only combating cyber threats, but predicting threats before they happen will come from cooperation between the Federal government and industry,” Gordon said. Analysis of larger data sets that come from both sectors will help establish patterns that may not have been evident before. “Cyber incidents are rarely random, but they are difficult to distinguish without proper context,” Gordon said, noting that artificial intelligence (AI) will likely be a key factor in this collaborative cyber monitoring environment moving forward. Gordon also acknowledged the importance of protecting the supply chain. While the priorities around protecting it may be different in the eyes of the Federal government versus industry, the two sides must work together to ensure all endpoints are secure. Recent studio hacks resulting in leaked television shows and movies ahead of scheduled release dates are a prime example of what happens when there is vulnerability in the supply chain. There will be missed opportunities in the evolving battle to secure our digital networks as long as the public and private sectors are working in silos. Gordon asserted that the Federal government is ready and willing to come to the table to work with industry, and that there is value in coming together to understand both sides’ perspectives. National security, and advancing cybersecurity, is something that affects all of us, and the burden of mitigating threats should not land solely on the Federal government. “We’ve got to get on our front foot, and that requires all of us,” concluded Gordon.